July 3, 2012: Summer is a good time to relax, sleep late, enjoy a break from school or work. Waking before sunrise is just not done. This summer is a little different. To find out why, set your alarm for dawn. Every morning this July, the two brightest planets in the solar system will put on a show before sunrise. Look out any east-facing window to see Venus and Jupiter, shining side by side, so close together you can hide them behind your outstretched palm. It's a great way to start the day. A new ScienceCast video previews the July 2012 sunrise sky show. Play it! On the 4th of July, Venus will be passing dead-center through the Hyades cluster, a loose grouping of stars 153 light years from Earth. Using binoculars, scan around the bright planet; you'll see dozens of stars scattered across the velvety-black sky. The temporary addition of Venus will make it seem that a supernova has gone off in the cluster. 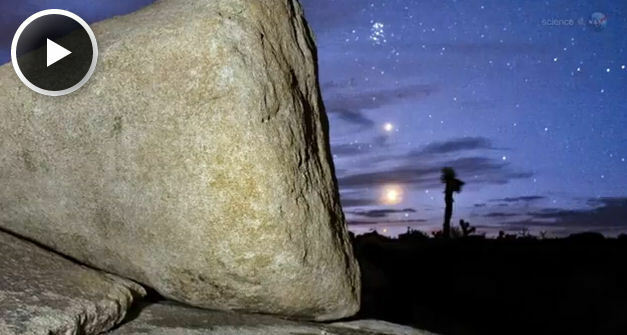 Three mornings later, on July 7th, Venus and Jupiter line up with Aldebaran, the bright red eye of Taurus the Bull. Aldebaran is a red giant star of first magnitude. Together with Venus and Jupiter, it forms an almost perfect vertical line in the brightening dawn sky. On July 9th, Venus and Aldebaran converge to form an eye catching planet-star pair. Scarcely more than a degree of arc will separate the two celestial bodies as Jupiter looks down from overhead. And then, on July 15th, a 12% crescent Moon joins the show, forming a bright celestial triangle with Venus and Jupiter. The slender arms of the crescent cradle a ghostly image of the full Moon. That's caused by Earthshine, sunlight reflected from our own planet onto the otherwise dark lunar landscape. 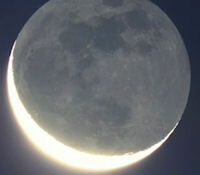 A crescent Moon with Earthshine is considered to be one of the prettiest sights in the heavens. A crescent Moon with Earthshine plus Venus and Jupiter--that's worth waking up for even in the middle of summer vacation. Start the day with more news about the heavens at science.nasa.gov.